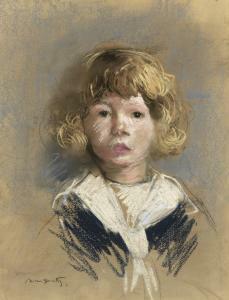 Find artworks, auction results, sale prices and pictures of Norbert Goeneutte at auctions worldwide. Norbert Goeneutte (French, 1854-1894) L'elegance: Mère et fille signed and dated 'Norbert Goeneutte/1879' (upper left) oil on panel 13 7/8 x 10 ½ in. (35 x 26.2 cm.) Painted in 1879. Provenance with Galerie Charpentier, Paris in 1951. with Laing Galleries, Toronto. Anonymous sale; Palais Galliera, Paris, 23 June 1961, lot 128. with Richard Green, London (inv. no. RH161). Acquired from the above by the present owner, 1994. 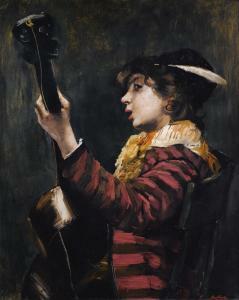 Norbert Goeneutte YOUNG BOY PLAYING THE GUITARE PARIS 1854 - 1894 AUVERS-SUR-OISE Bears the stamp lower right Norbert Goeneutte Oil on panel 56,2 x 45,2 cm ; 22 by 17 3/4 in Provenance Sale, New York, 29 May 1981, lot 9 ; French private collection ; Purchased from the above by the current owner Exhibited Norbert Goeneutte, Musée Pissarro, Pontoise, 15 May - 30 September 1982, n°11 Catalogue Note Carolus-Duran's son probably modelled for Goeneutte for this painting. The two artists certainly met in Paris in Edouard Manet's studio. Norbert Goeneutte PORTRAIT OF PIERRE GUÉRARD Signed lower left Norbert Goeneutte Pastel on pencil lines on paper 38,5 x 29,5 cm ; 15 by 11 5/8 in. 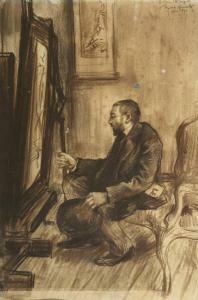 Sale, Hôtel Drouot, Paris, 11June 1995, lot 146 ; Sale, Hôtel Drouot, Paris, 16October 1999, lot 11 Jean Guérard, born in 1883, was Eva Gonzales (1849-1883) and Henri Guérard's (1846-1897) son. 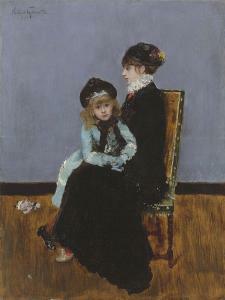 Goeneutte was very close to the family and executed several family portraits, such as this charming work. A painting by Eva Gonzales is presented in the sale, lot 484. 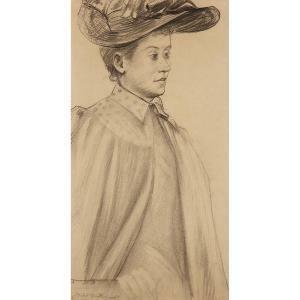 Norbert GOENEUTTE (Paris 1854-Auvers-sur-Oise 1894) Portrait de Reine Goeneutte, sur de l'artiste Crayon noir, estompe Signé en bas à gauche Insolé, pliures Portrait of Reine Goeneutte, sister of the artist, black chalk and stumping ; Signed in the lower left 41,5 x 22 cm - 16 5/16 X 8 11/16 Exposition : Galerie La Scala 2001.